In this site we can search the all details pertaining to the disabled persons such as Physically handicapped, Visually handicapped, Mentally retired and some other categories. For this a person has to attend the sadarem camp on their premises. Normally the Sadarem camp will be in Area Hospitals of the District or Revenue Divisions. 1. Candidate has to attend the Sadarem Camp in their respective reasons. 2. Specialists will check the candidate thoroughly by performing some medical tests to caliculate the disability percentage of the candidate. 3. After they satisfied with the results they will take the sadarem print out of the candidate and they will sign on the certificate. 4. After the make sign on the certificate they will upload the certificate alongwith ID card to Sadarem website. 5. Candidate can take printout of the certificate in MEESEVA by paying some challan charge. After click on "Quick Search" the page will be opened to see like this.. 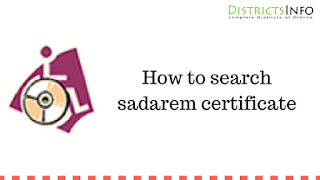 If candidate does not know the sadarem ID and UID he/she can search District, Mandal, village level members of sadarem candidate. Normally The Telangana state Government issuing aasara pension to disable people if he/she have above 50% disability. Description : Social Security Pensions - Assessment of degree of disability through software - Guidelines for assessment - Issue of certificates - Orders - Issued. Description : Women Development, Child Welfare and Disabled Welfare Department - Persons with Disabilities - Guidelines for evaluation of various disabilities and procedure for certification -Comprehensive Orders -Issued.